I was sitting around watching the Inauguration coverage and this new ‘Velveeta’s Book Club’ commercial came on. While I appreciate it’s humor, I think it’s indicative of how people view book clubs. I’m still trying to decide whether it’s offensive or if I’m just overly sensitive about my beloved books. I’m sure some may think I’m nuts while others may launch a boycott of Velveeta, since that’s the go-to response to anything slightly controversial nowadays. But I won’t jump into all of those arguments and will just ask you this: What do you think? What is a Book Wheel? 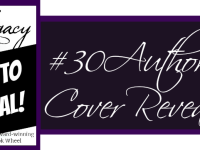 The #30Authors Book Cover is Here!